As all seasoned anglers know, figuring out how to effectively fish new water can be tough. Some of it is just time spent on the water, learning what’s effective with certain fish in a different environment. But, knowing what gear to use can help set the new angler miles ahead. There’s nothing worse than not having what you need to be successful, right out of the gate. That’s why we have compiled this page of essential gear. You get to use the knowledge that it has taken us years to learn about what is the best gear for redfishing on the Texas Flats. Not only are you getting the benefit of the years of experience that our Captains have behind them… but you also know that we put our gear to the test and if it’s not working, not holding up, and not doing the job… we don’t use it. 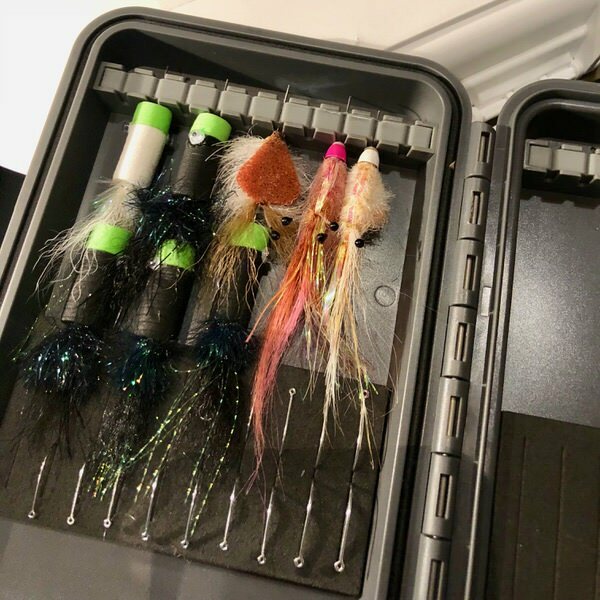 So, read on to learn more about the rods, reels, terminal tackle, and proper attire that helps set us up for success each day we are on the flats. This isn’t your local trout stream! On the flats, you’ll want something with a bit more backbone. We prefer 7 to 9 weight rods, with an 8 weight being our most common choice for day to day use. These rods are perfect for punching casts into the wind, tossing heavier crab patterns and of course fighting our largest redfish. While all casts, or casters, are not created equally, we do find that fast action rods are best for most of our salt applications. While fly fishing the waters of Southwest Texas, it is very important to be fast to your target. Seconds count out here, so you want a rod that will load quickly and with minimal false casts. This can make all the difference when stalking some of our most elusive fish. While an 8 weight rod is our most common choice each day, we do often keep a heavier 10 weight around as well. Season permitting, we can encounter jack crevalle, cobia, king fish or tarpon. So a bit heavier rod is always handy to have around when these opportunities are common. What’s in our boat: All of our boats carry Echo EPR fly rods in 7, 8 and 10 weights. A large arbor reel not only helps balance your higher weight fly rods, but also has more space to house your backing and fly line. Its not uncommon to see your backing, while fighting a redfish on the flats. The larger arbor will allow plenty of space to hold more than enough line and backing and also recover line very quickly during the fight. Look for a large arbor reel with a closed drag system and strong drag. Our saltwater fish can pull very hard. So you need to be able to depend on your reels drag system out there. The closed drag system will also help insure the inner workings of your reel are protected from the saltwater. The salt can be tough on gear. So a good quality reel is always worth the investment! Whats in our boat: Each of our rods is paired with Echo Bravo large arbor fly reels. 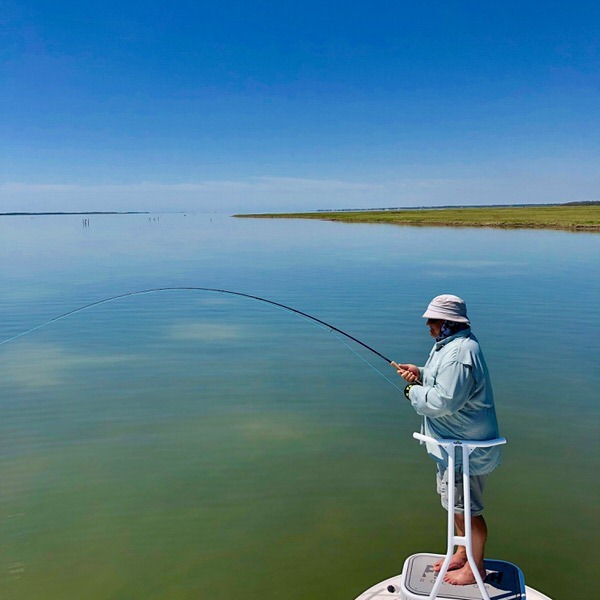 A floating line is the line of choice while fly fishing for redfish in Southwest Texas. Most all of our days are spent in a foot of water, or less. So a floating line is perfect for all of our flats fishing applications. We prefer a very strong weight forward floating line. Our favorite is the Gulf Redfish or Tropical Punch lines from Airflo. Both load very quickly and shoot easily with minimal false casts. Ideal for being quick to your moving target on the flats. We prefer to overline all of our fly rods in the saltwater. This means, moving one line weight up from what is recommended for your fly rod. 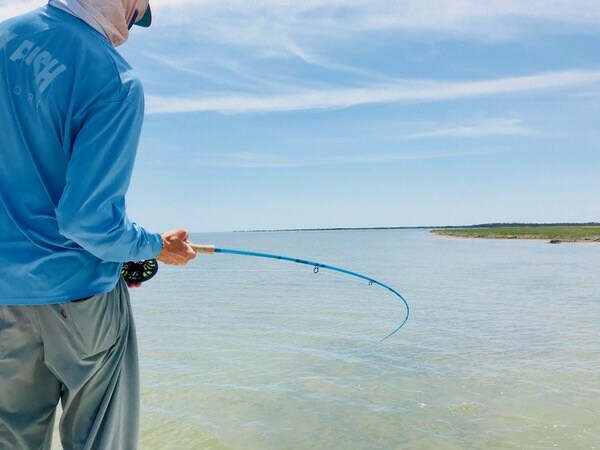 While not everyone does this, nor is it required to do so, we find that it helps the angler load the rod and punch casts through a pesky Gulf breeze. So all of our 8 weight fly rods are paired with a 9 weight floating line. What’s in our boat: All our reels have the Airflo Chard Tropical Punch or Airflo Gulf Redfish floating line. While a sinking line is not an every day item in our boat, there is still a time and place to have one around. Typically, we would use a sinking or sink tip line when fly fishing offshore or nearshore on the Texas Gulf Coast. Given the appropriate time of year, opportunities for Jack Crevalle, Mahi Mahi, Spanish Mackerel, Cobia, King Fish or Tarpon do arise. Sometimes, these fish are present but not showing themselves on the surface. So a sinking fly line can help you get your fly down to their level in the water. We do not overline our rods, when fishing a sinking or sink tip fly line. Instead, we prefer to match the line weight to the rod. 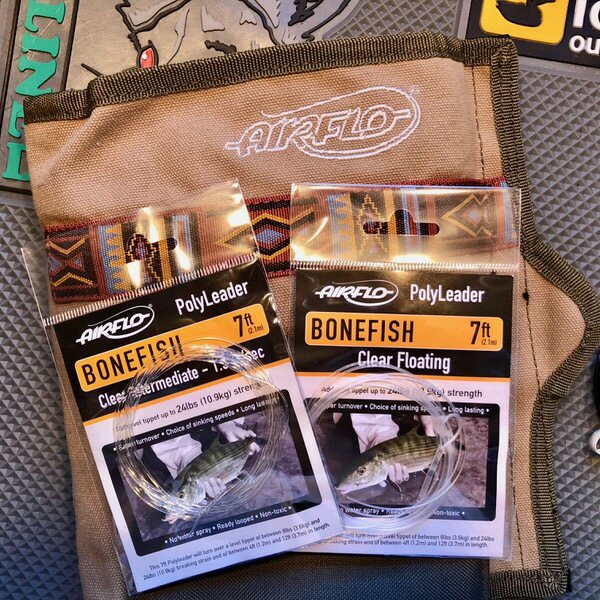 What’s in our boat: We prefer the Airflo Ridge Striper line for colder water and Airflo Beach for warmer water. A 7-9 foot tapered leader is ideal for most of our Texas saltwater fly fishing applications. These leaders should taper down to approximately 16-20lbs. From there, we typically would add another 2-3 feet of tippet material. We prefer to have both floating and intermediate leaders for our every-day fishing conditions. While fishing for other seasonal species; jack crevalle, tarpon, etc., we do tie our own custom leaders to meet those specific needs. What’s in our boat: We equip all our rods with Airflo Poly Leaders in floating or intermediate. Your tippet is a vital piece of equipment out on the Texas flats. The tippet attaches to your leader. But more importantly, attaches your fly. So it is crucial that you have the right stuff. We carry fluorocarbon tippet material specifically engineered for the saltwater in all of our boats. This tippet is strong, secures knots well and is the least visible in the water that we have seen. 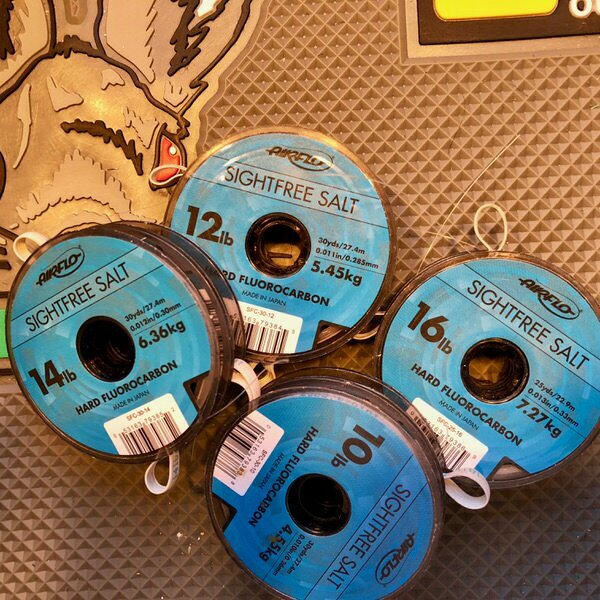 What’s in our boat: We carry Airflo Sight Free Saltwater tippet in 10, 12, 14, 16 and 20 lb. weights. We use a wide variety of flies while fly fishing the Texas flats. The patterns we use each day are selected based on the species we are targeting, water we are fishing, time of year, feeding patterns of fish and many other factors. But it is important to have a good selection of crab, shrimp and baitfish patterns to choose from. 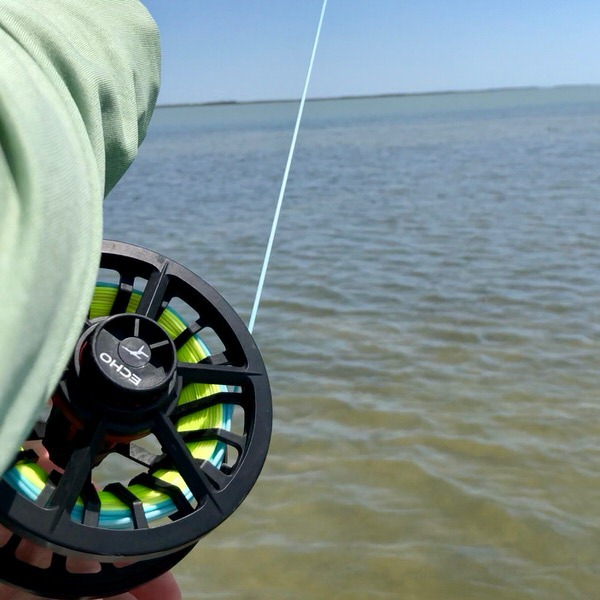 To get a look at the flies we use while fly fishing Rockport, Texas and the surrounding waters, head over to our Saltwater Flies page. Look for clothing that’s lightweight, moisture wicking, and has maximum coverage from the sun (ie. long-sleeve shirt). You’ll also want to bring layers for cold weather days or early mornings and a rain jacket, because you never know out there. If you’ll be fishing from a skiff, shoes with non-marking soles are a must. You can also fish in flip flops, wading booties or simply kick your shoes off and go barefoot in the boat. NOTE: Wading booties or wading shoes are REQUIRED if you intend to get out of the boat to wade fish. Polarized sunglasses are a must. You’ll want lenses with good coverage, to limit glare from the water. For the best vision, we recommend amber and medium lens colors. A hat serves two purposes: sun protection and improving visibility, by helping cut glare from the sun and off of the water. Dark under bill hat colors cut glare best. Face masks protect your face from sun rays reflecting off of the water (something a hat can’t do). If you don’t want to go home with severe sunburn, check out Fishmasks. Gloves protect the tops of your hands from sun rays. If you don’t want to wear gloves (or any other item recommended in Attire), be sure to use plenty of sunscreen. NOTE: Don’t handle fish with gloves on!